Raising up the Next Generation of servant leaders and heroes of tomorrow! Think back to childhood, to the wonder held in your heart, with all the hopes and promises of tomorrow. Do you remember what you wanted to be when you grew up? A doctor, a scientist, an artist, or maybe even a doctor-artist? Hey anything was possible at the age of 7! Our kids are resilient and brave, and despite the obstacles many of them face, Side by Side Kids has been a place where those promises and hopes have come within reach. More than an afterschool program, we believe in the God-given talents they possess, and all they can become. We aim to foster confidence in their abilities, but we can't do it without your support! Today you have the opportunity to be a part of one of the most impactful movements in Texas- to lift up under-served kids in our communities to become servant leaders and heroes of tomorrow! Starting at just $10 a month (the price of two lattes at Starbucks) you can make a difference by joining the Next Generation monthly giving program to be a part of molding the leaders of the future, today! 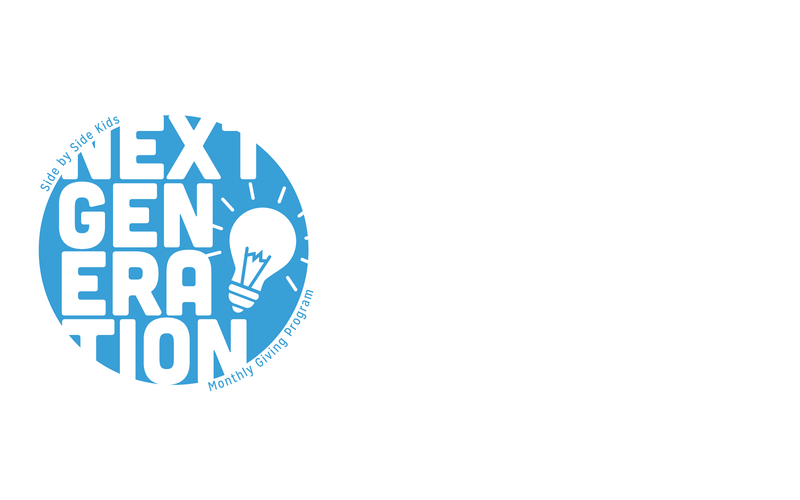 Becoming a Next Generation Ambassador comes with its perks! *Student mentor days are an opportunity to come once a month to visit with our kids. It's an intentional opportunity to pour love, empowerment, and build confidence with them.